Finding a reputable business can be a worry, but your opinion will help other consumers chose with more confidence when looking for someone they can trust. Please take a moment to complete this form. Your feedback helps us show firms that we appreciate their high standards and learn from your suggestions. In addition, you will be entered into an annual draw to win £100 of High Street vouchers. Your feedback will be given to the firm and your comments and ratings may be published. We will not give your personal details to anyone else. An ARTS auditor (an employee of Angus Council's Trading Standards team) may need to contact you to discuss your feedback. 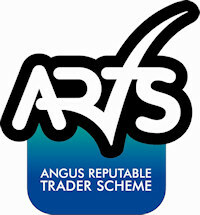 For more information, please visit our website, email traderscheme@angus.gov.uk or call Angus Trading Standards on 01241 435600. Thank you.